The period following the prosperous reign of Pharnavaz, the first king of Iberia, was one of incessant warfare as the kingdom was forced to defend itself against numerous invasions. 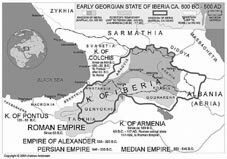 Iberia lost some of its southern provinces to Armenia and the Colchian lands seceded to form separate princedoms. At the end of the 2nd century BC the Pharnavazid king Farnadjom was dethroned by his own subjects and the crown given to the Armenian prince Arshak, who ascended the Iberian throne in 93 BC, establishing the Arshakids dynasty. This close association with Armenia brought upon the country an invasion (65 BC) by the Roman general Pompey, who was then at war with Mithridates VI of Pontus, and Armenia; but Rome did not establish her power over Iberia permanently. Nineteen years later however (36 BC) the Romans again marched on Iberia, forcing King Pharnavaz II to join their campaign against Albania. While another Georgian kingdom, Colchis, was administered as a Roman province, Iberia freely accepted Roman imperial protection. A stone inscription discovered at Mtskheta refers to the first-century ruler Mihdrat I (AD 58-106) as "the friend of the Caesars" and the king "of the Roman-loving Iberians." Emperor Vespasian fortified the ancient Mtskheta site of Arzami for the Iberian kings in 75 AD. The next two centuries saw a continuation of Roman influence over the area, but by the reign of King Pharsman II (116–132) Iberia had regained some of its former power. Relations between the Roman Emperor Hadrian and Pharsman II were strained, though Hadrian is said to have sought to appease Pharsman. However it was only under Hadrian's successor Antoninus Pius that relations improved to the extent that Pharsman is said to have even visited Rome, where Dio Cassius reports that a statue was erected in his honour and that rights to sacrifice were given. The period brought a major change to the political status of Iberia, with Rome recognising it as an ally rather than a subject state, a status it retained even during the Empire's hostilities with the Parthians.